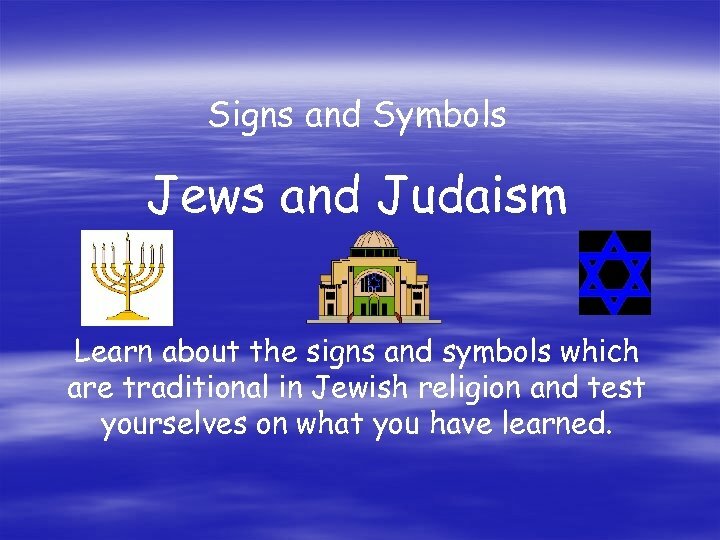 Signs and Symbols Jews and Judaism Learn about the signs and symbols which are traditional in Jewish religion and test yourselves on what you have learned. 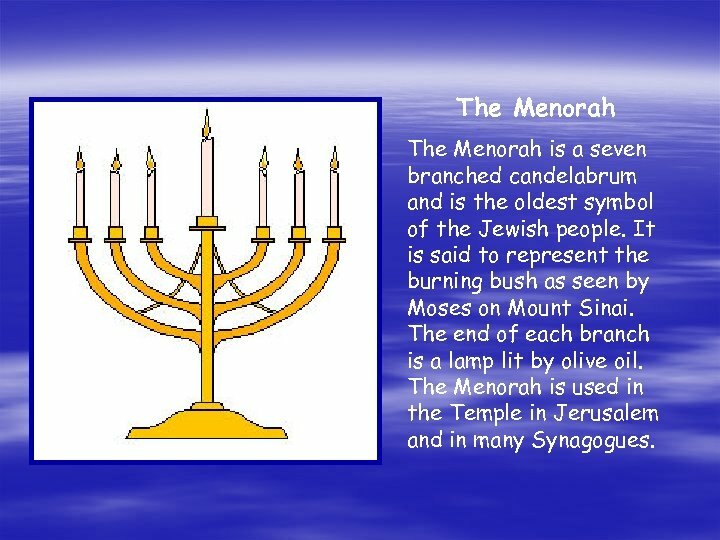 The Menorah is a seven branched candelabrum and is the oldest symbol of the Jewish people. It is said to represent the burning bush as seen by Moses on Mount Sinai. The end of each branch is a lamp lit by olive oil. The Menorah is used in the Temple in Jerusalem and in many Synagogues. 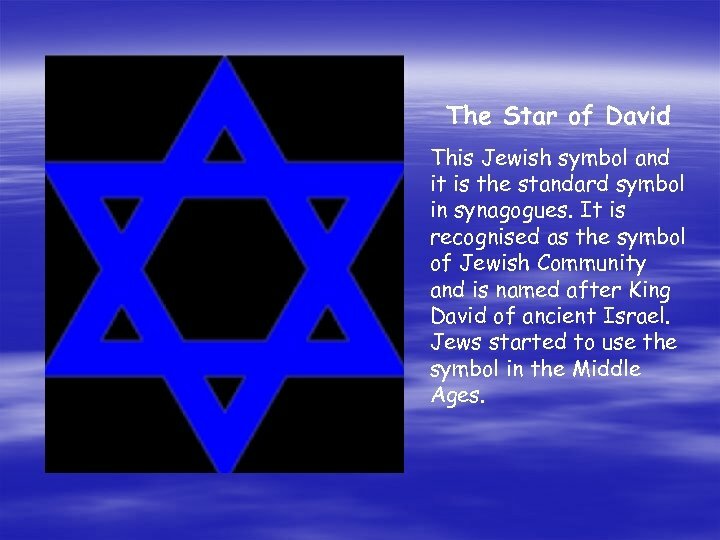 The Star of David This Jewish symbol and it is the standard symbol in synagogues. It is recognised as the symbol of Jewish Community and is named after King David of ancient Israel. Jews started to use the symbol in the Middle Ages. The Mezuzah is a scroll which Jewish people keep inside a case (pic above) and fix to the right side of their door frames. 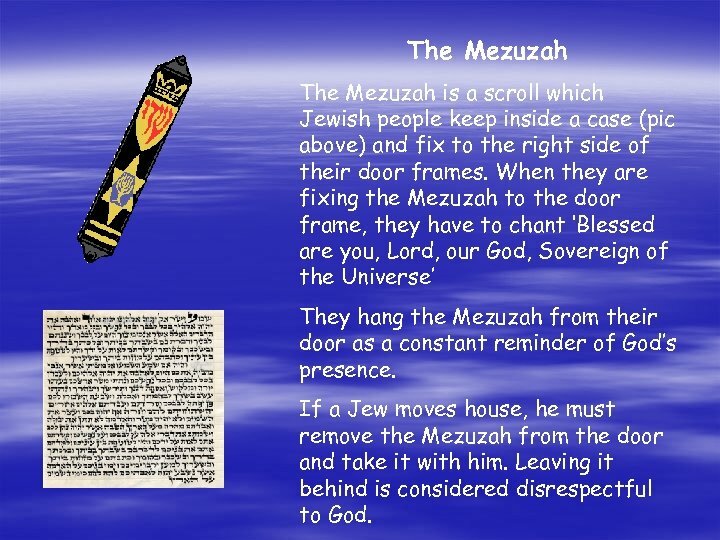 When they are fixing the Mezuzah to the door frame, they have to chant ‘Blessed are you, Lord, our God, Sovereign of the Universe’ They hang the Mezuzah from their door as a constant reminder of God’s presence. If a Jew moves house, he must remove the Mezuzah from the door and take it with him. Leaving it behind is considered disrespectful to God. 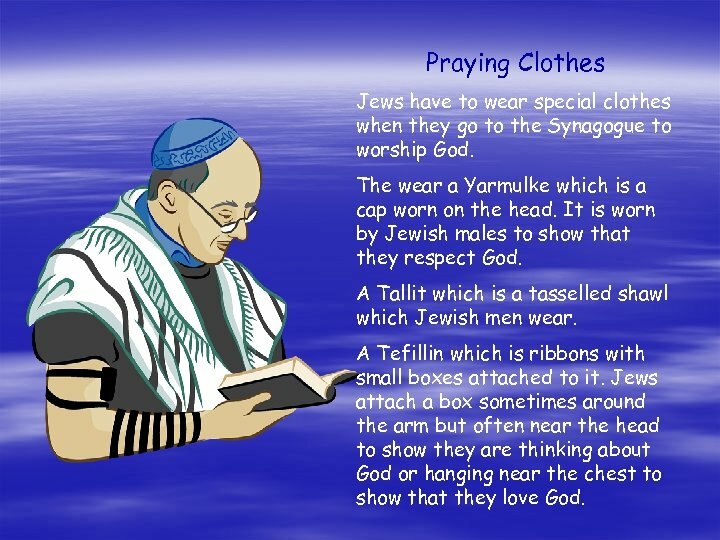 Praying Clothes Jews have to wear special clothes when they go to the Synagogue to worship God. The wear a Yarmulke which is a cap worn on the head. It is worn by Jewish males to show that they respect God. A Tallit which is a tasselled shawl which Jewish men wear. A Tefillin which is ribbons with small boxes attached to it. Jews attach a box sometimes around the arm but often near the head to show they are thinking about God or hanging near the chest to show that they love God. 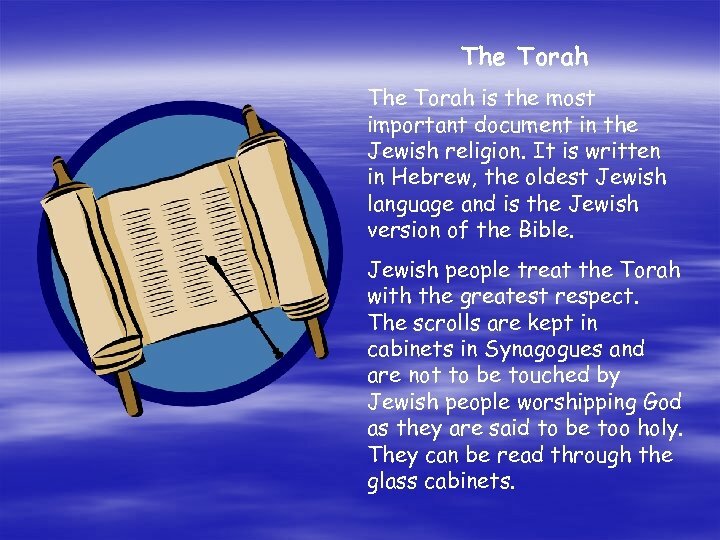 The Torah is the most important document in the Jewish religion. It is written in Hebrew, the oldest Jewish language and is the Jewish version of the Bible. Jewish people treat the Torah with the greatest respect. The scrolls are kept in cabinets in Synagogues and are not to be touched by Jewish people worshipping God as they are said to be too holy. They can be read through the glass cabinets. 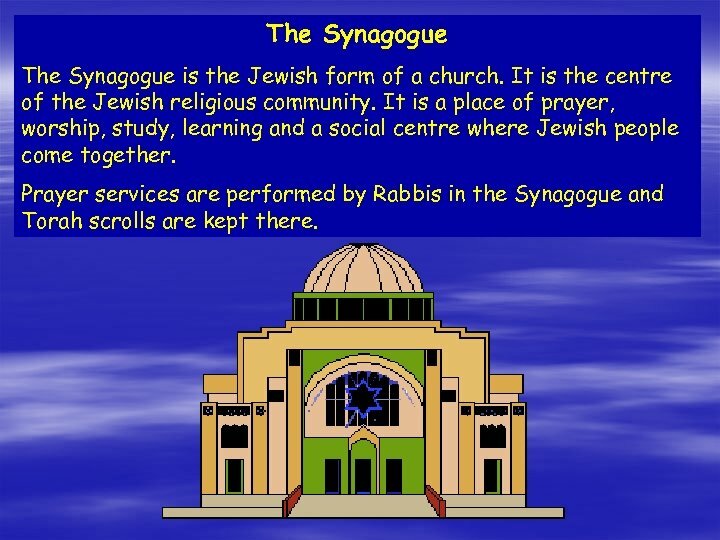 The Synagogue is the Jewish form of a church. It is the centre of the Jewish religious community. It is a place of prayer, worship, study, learning and a social centre where Jewish people come together. Prayer services are performed by Rabbis in the Synagogue and Torah scrolls are kept there. Now discuss with your partner what you have learned and complete the task. 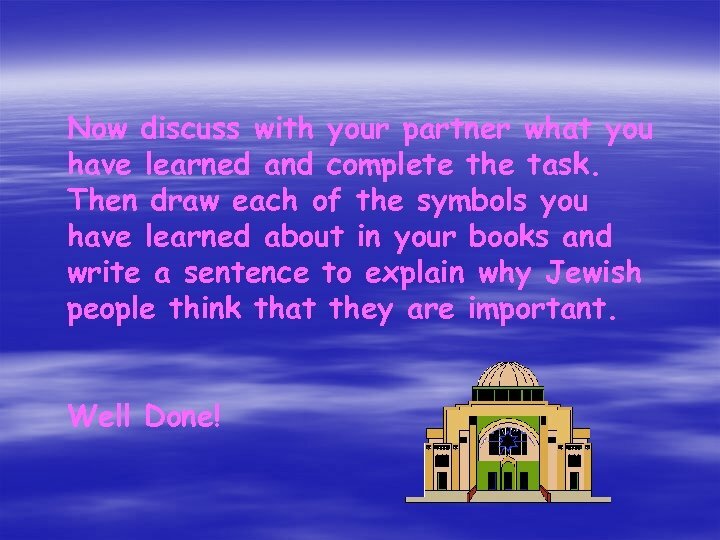 Then draw each of the symbols you have learned about in your books and write a sentence to explain why Jewish people think that they are important. Well Done!